A walk, a bike, a wine – These Two Eyes! My tram home from Flinders Street to the corner of Swan and Church Street took less then 10 minutes. Bliss. Today I was a local and a tourist at the same time, and it was one of the best days I’ve had in Melbourne yet! So what if my Saturday night consisted of staying home alone watching an all night marathon of Modern Family? For the first time in a long time, I woke up on a Sunday morning bright and early, ready to take on the world and the only thing on my agenda was a shiny new bike. Then I thought a crazy thought. What if I walked all the way there? Yup, a whole 5 kilometers! Yes, this is the solution. I won’t feel guilty about not running, nor about the 3,000 wines on Friday night. I’m excited; this will be an adventure. Walking up from Church Street to Bridge Road my first stop was brunch at Gypsy & Musquito with Anne Marie. Oy what a fancy menu. I ended up with some healthy sounding zucchini and pea fritters, her with avocado smash with delicious mushrooms as we took notice of the grandmother-esque interior. Water served out of an oversized jam jar, mismatched utensils, recycled wooden chairs and is that a backseat of a car converted to a table bench? Mmm smack my lips good, this could become a weekend regular. We walked on as we digested. North on Church Street then across Victoria Street, passing Little Vietnam. Our voyage took us beyond notorious I Love Pho, then by a large Asian grocer, glazed ducks hanging by their feet in the window and fresh yum cha signs called my name. I made a mental note of where to eat on future visits. 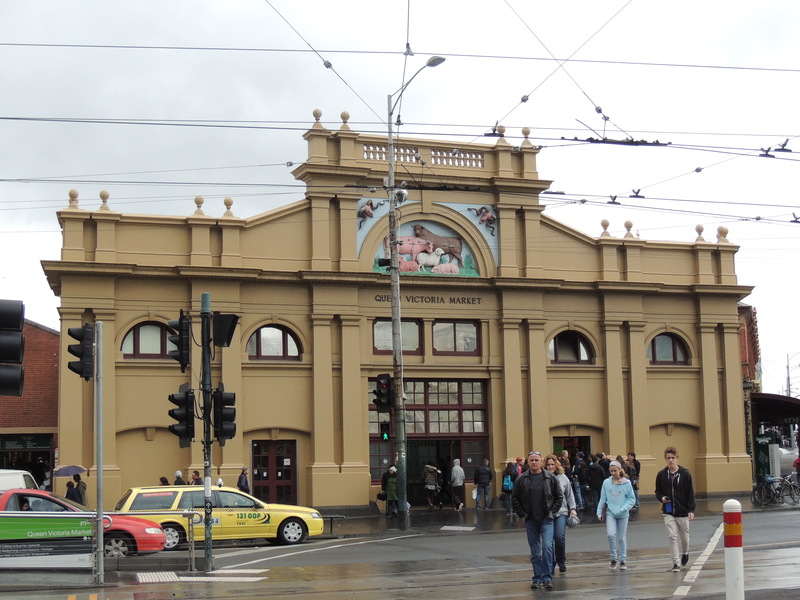 Pushing further on, we strolled along the tram tracks against the exterior of Collingwood, Fitzroy, then Carlton, hugging Carlton Gardens before we were on the edges of the inner city seeking out Elizabeth Street and the Queen Victoria Market. But before we divulged in the shopping mecca, I needed to stake out my potential new bike. I’ll admit it. I want a hipster bike. I want a vintage looking bike, half beach cruiser, half traditional. I want comfort and color and a basket and bell and to relive my glory days riding my bike to the bar, and work, and everywhere in Hoboken, New Jersey. Lucky for me Reid Cycles was having a sale! I still couldn’t call it a day there. Down the block I encountered my first visit to Queen Victoria Market. The locals say that it’s a bit of a tourist haven and market-wise, a bit over-rated. Apparently there are better city markets. But for my first visit I took in all its glory. I thought of potential Christmas presents and food options for future dinner parties. From cheap trinkets and souvenirs to smelly cheese, fresh produce and raw meats I vowed to return on a day where I actually had a shopping agenda. There was nothing but a long line standing between me and the Spanish donuts, aka churros with chocolate dipping sauce. But after zigzagging up and down rows and rows of unneeded goods, there was no other option. Onward to wine. We walked down Elizabeth Street into the city to little lane ways where we could hide from the rain and warm under outdoor heaters. 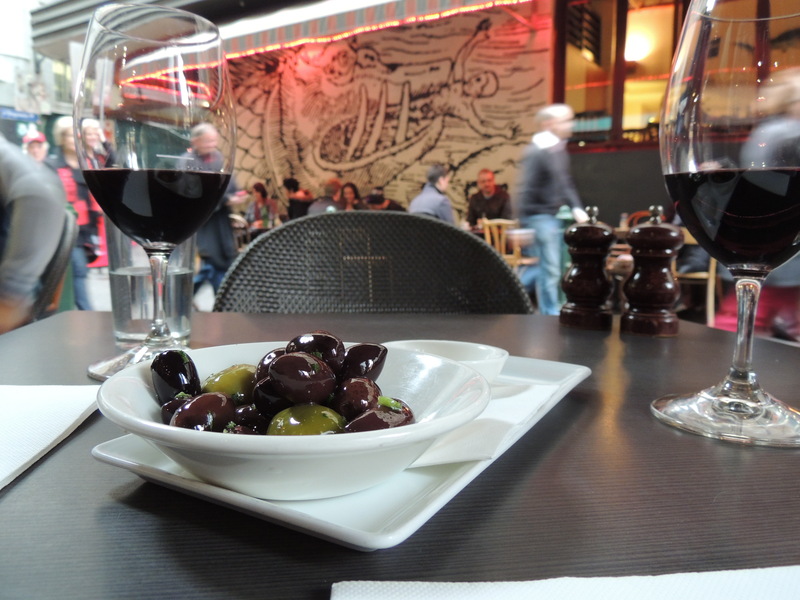 The little Italian restaurant on vibrant Degraves Street was the answer and after a few, then another few at Hells Kitchen on Centre Place, I let my legs rest from the long walk and finally felt at peace. It was a Sunday after all so we called it a day around 5 pm and caught our respective trams outside Flinders Stations. I didn’t make my bike purchase today but likely will soon. So I ask again, what color? I like the Mint one!